Lemon Harangue Pie: British police: 'Turn in your knife, surrender your life.' Or something like that. British police: 'Turn in your knife, surrender your life.' Or something like that. Six years ago, I made note of an interesting story from Great Britain about an "anti-stab" knife invented by industrial designer John Cornock. His line of knives, aptly named New Point, was inspired by a report about the life-threatening knife injuries doctors had to deal with every day. Unfortunately, Mr. Cornock's potentially life-saving design hasn't caught on fast enough. 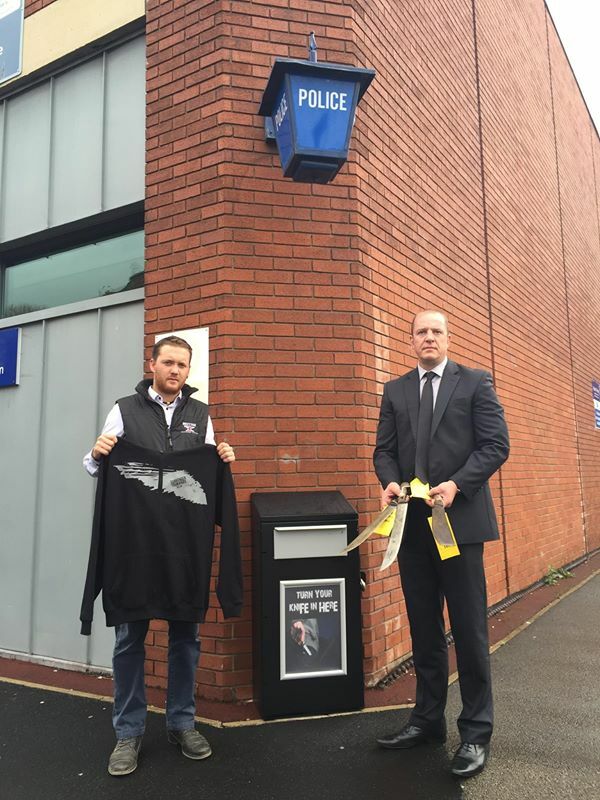 Last year, police in Lancashire took a more drastic approach, starting an amnesty campaign designed to get Brits to turn in their more lethal, pointy knives. 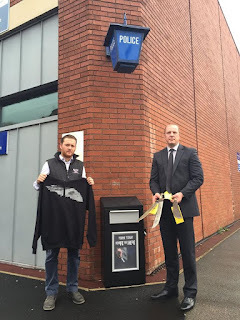 It's a rather simple concept, much like the gun buyback scams perpetrated here in the U.S. Lancashire's law-abiding residents simply deposit their blades into designated "amnesty bins" conveniently located at various police stations across the county, and knife crime magically disappears. Labour Police and Crime Commissioner Clive Grunshaw funded this brilliant program. "No-one should live in fear of knives being used in their community," he said (presumably in a snooty, condescending tone), "and I hope anyone in possession of an offensive weapon will use this opportunity to protect both themselves and those around them, by handing it in." Move away from the situation towards a public place (shop, house, restaurant etc.) as quickly as possible. Make as much noise as you can. Instead of carrying a knife, carry a personal alarm. And, above all, don't even think about bringing a gun to a knife fight. This is Great Britain. If you want the right to defend yourself, move to America. Similar programs have since sprouted up all across the U.K. The result? As of this past July, knife crime has gone up for the first time in four years. A 2% rise in all knife offenses has been reported, along with a 13% rise in assaults with a knife. What a shock. You've got to hand it to our progressive friends across the Pond. They may not be the sharpest knives in the drawer, but they certainly are a persistent lot.